There’s a great opening scene in Princess Mononoke, where a quiet, pastoral village is beset by a thunderous, crazed, giant boar. The creature is covered with a thick skin of blackened tentacles that snarl and snake with wild abandon, and it becomes more than a second skin. It’s monstrous and foreboding, like something Ray Harryhausen would cook up if he had a bad trip while watching The Beatles’ Yellow Submarine. Ashitaka, the young chieftain of the village, launches into pursuit, and we’re hurled into a chase sequence. It’s thrilling to watch, and the camera swoops and dives right in the action. There’s an almost desperate momentum at play, as this enormous, mutated thing stampedes on, while the boy vainly tries to calm it down. He is reluctantly forced to bring the creature down with two well-placed arrows, but not before one of the black tentacles latches onto his arm; Ashitaka saved his people but is left burned, scarred. For those of us in the West, this was our first introduction to Japanese filmmaker Hayao Miyazaki, and we were instantly hooked. Back home, Japanese audiences who loved his work would flock to theatres, break all box-office records and make Mononoke a phenomenon. They also had an added advantage of knowing the score; knowing that the opening chase is a clever reenactment of an early chase scene in Nausicaa of the Valley of Wind. In that film (and the graphic novel on which it’s based), the heroine successfully calms down a stampeding Ohmu, a giant, green bug with claws and a dozen eyes. Now, in the new version, the tone is different, and the mood is shockingly bleaker. The setup is the same, but the payoff is tragic; the hero is fatally cursed, and doomed to walk alone in search of answers. The serial adventure has collided into the anti-war picture. Miyazaki’s earlier works, from Animal Treasure Island and Future Boy Conan to My Neighbor Totoro and Kiki's Delivery Service, carry a romantic idealism at their core. But now, in middle age, we see the emergence of the serious, somber Miyazaki. Miyazaki, the heartbroken idealist. Miyazaki, the cynic. Mononoke is a much darker picture, wrestling with complex themes and issues, one that clearly has no patience for pat solutions or easy answers. Mononoke is often referred to as a movie about how man and nature should get along, but that’s not really accurate. It’s a movie about how man and nature don’t get along. Nobody gets along with anyone, and it's far too late for talking. The knives are drawn and everyone wants blood. When the title character is finally introduced, Ashitaka has traveled to the edge of a mystic forest and walked into the middle of a full-scale war. San, the wolf girl, the Princess Mononoke, her adoptive wolf pack on one side, fighting to preserve the forests; Lady Eboshi, her women equipped with firearms, on the other, their ironworks village clearing the land to mine their ores. Within each side lie several factions, all pushing and pulling in different directions. Everyone grows distrustful of each other. The Ape Tribes, who plant seeds and grow in despair; the Boar Tribe, who seek slaughter on the battlefield; rival samurai clans who seek to capture the ironworks for their own; Jigo, a conniving monk whose army is hired by the Emperor; the men of the ironworks, quietly resentful of the woman who marched in and took over their town, succeeding where they never could. At the center of everything lies the Shishigami, the Deer God who calls the mystical forest his home, who comes and goes with the wind. This is a God who is ultimately unknowable, intimately connected at one moment and distant the next; its motives and reasons, even its itentity, are always in question. There are really two movies at work here. Western audiences can enjoy Mononoke on a purely visual level, marveling at the astonishing detail, the terrific animation, the lush and varied color tones, and the swift movements of the camera. CGI is used to great extent, mixing with the cell animation, and it all looks stunning. But notice how the computer animation is used to support the action; note how its use in scrolling and panning allows for more dynamic camera work, capturing compositions and landscapes straight from Ford and Kurosawa. Japanese audiences are far luckier; they got to see the real movie. This is the first film Miyazaki directed since completing the Nausicaa comic. Nausicaa the novel was wildly successful, first appearing in Animage magazine and then selling ten million copies as a seven-volume series of books. What makes it great is how the story grows and expands as it goes along, and this is because Miyazaki took long breaks when working on his pictures. Each time he returned to Nausicaa, the scope widened, the themes became more complex, and the issues became more nuanced. What began as a Buddhist spaghetti western evolved into a serious examination on feminism, the environment, war and pacifism, human suffering, life and death, and the nature of God. Miyazaki had finally retired the novel he spent nearly fifteen years writing, but here he was again, plunging back into these themes and adapting them to a story set in 14th Century Japan (and deconstructing much of its history and mythology in the process). This is why I refer to Princess Mononoke as his Ran; it’s a grand summing-up film. It’s the final statement from his serious side, and the fingerprints are all over the picture. Like that early chase scene, most of the key moments in the film are taken from Nausicaa; minor moments like camera shots, scenes that draw parallels, even the characters themselves. Ashitaka and San truly are Nausicaa’s children (goodness knows they have the haircut - the moment when Ashitaka cuts his top-knot is almost comic). One child is the spiritual pacifist, the other the fierce warrior. Notice how, even here, the gender roles are reversed; it’s the girl who goes for the knife, and the boy who pleads for understanding. That defiant feminism has always been a Miyazaki trademark, and it shines brighter here than any other Ghibli production. These characters are allowed dimension, nuance. Where is the melodrama? Who’s the good guy? Who’s the villain? There is no good or evil side, only living beings trying to do the best they can, controlled by circumstance and driven, inevitably towards the final violent climax. San is driven by her obsession to kill Eboshi, compelled and repulsed by her attraction to Ashitaka, confused about her identity. Eboshi, in turn, carries her own obsessions – she seeks to kill the Deer God and take the forest – but she also displays compassion and empathy; she takes in prostitutes and lepers and identifies closely with them. And poor Ashitaka, the conscience of the film (his name literally means “tomorrow?”), is pushed aside. Nausicaa asked, “Can’t we all get along,” and people listened; this wandering prince makes the same plea and gets beaten down. Nobody wants to listen, because this is opera; everything must end tragically. Despair and hope lie intertwined in its final message: no matter how difficult it is, we must live. 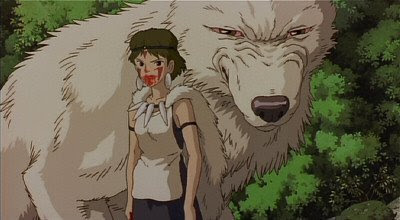 Princess Mononoke is a violent movie, with lots of blood and severed limbs, but doesn’t revel in it. The mood is one of sadness, of loss. The tension is ratcheted up and up (Miyazaki is a master of action cinema), and when it explodes, the results are stunning. There are crucial moments when I was shocked to my core as the climactic bullet came. One such scene is when San infiltrates the ironworks and into a death trap; Ashitaka literally walks into the middle of a knife fight between the two women. The other is when all the parties converge, in the final act, on the Deer God’s lair. The Shishigami appears, shots are fired, bodies fall. Great moments in that stay with you: the Shishigami walking through the forest at night, drawn like a Native American painting and greeted by tree spirits; peaceful transitional moments, rain falling on rocks; watching three kodama mourn a cut plant; the whole subplot involving Ashitaka’s gold dagger (cruelly cut out of Miramax's overrated American dub); the two lovers realizing that they cannot live together; the battle scenes, which are wonderfully stylized; that iconic image of San, riding against a fiery red background. Mononoke is grand opera in the fullest sense. "...the whole subplot involving Ashitaka’s gold dagger." --Woah, wait. Can you explain what this is? I'm an original Japanese version kind of guy, and I just watched Mononoke again tonight... but I didn't catch anything like this. There isn't footage missing on the domestic release, is there? I think I require some enlightening. Could you explain what this is to me? Thank you! This is a beautiful review, by the way. Well, there is the crystal dagger given to Ashitaka by his sister (I believe), but that's present. i can't find anything anywhere else about a gold dagger. Hey, you're right about the dagger being "crystal" instead of "gold." Yeah, I know, this is "Shatner on SNL" turf. Here's the "dagger subplot" in a nutshell: Kaya is not Ashitaka's "sister." They're lovers. They're a romantic couple. The "sister" was a botched translation on Neil Gaiman's (and Disney/Miramax) part. As far as I'm aware, it was an honest mistake, but without it, the symbolism of that dagger completely falls to pieces. An added wrinkle to this saga: the girl is actually the heroine in Miyazaki's 1980 Mononoke Hime book, the collection of image boards for an unrealized movie project. Ashitaka has to choose between two women who both share the same name. Ah, I see. You can see how I made the mistake otherwise, though; she does look pretty young. And I won't blame Neil Gaiman too much; in my book, he's the man.